Where's My Water? : Gong Xi Fa Cai! 恭禧發財 Xin Nian Kuai Le! Today is Chinese New Year, the start of a new year in the Lunar calendar. So let me start this post by wishing you all a Happy New Year! 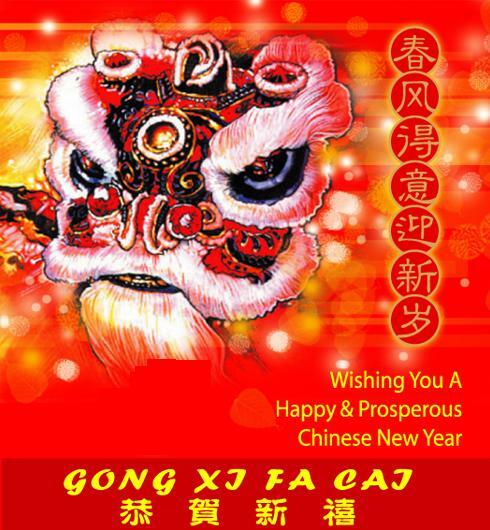 May the year of the dragon bring you lots of good fortune. Here's wishing a happy and prosperous year to you and your families! One of the most important events of Chinese New Year is the reunion dinner, which takes place on the eve of the Lunar New Year. This stems from many years ago, when family members would have to leave their family home for different reasons, whether it be study or work. They would rarely see their families and loved ones, but would return home at least once a year on New Year's Eve to be reunited. Apparently in traditional China, hundreds of years ago, the Chinese used to release criminals so that they could go back home to spend reunion dinner with their families. Whilst I see all of my family members quite regularly (the ones living here in Melbourne anyway) and certainly none of us need to be released from prison, Chinese New Year is always an indulgent affair! We need no excuse to gather for a hearty meal, and Chinese New Year is a perfect reason for a feast! Traditionally, families must go to the paternal home for reunion dinner. For example, my family would all go to the home of my father's family. Once women get married, this is where they must attend dinner on New Year's Eve. If I got married, I would be expected to attend reunion dinner at the family home of my husband, and if my brother got married his wife would have to attend dinner with his family. Fortunately, we are not so traditional in this sense. My dad's brother had to go to work last night, so we had a reunion lunch instead. This meant that we went to see mum's family for reunion dinner. SCORE - two feasts! By the time lunch was finished however, I was struggling to breathe! Yee sang is a special dish which is served during New Year. It contains all sorts of shredded vegetables, herbs, and slices of raw salmon before being sprinkled with fried crispy crackers and drizzled in a thick sweet sauce. Everybody dives in with their chopsticks together to mix the salad, as you "lo hei" for good luck. Chinese sausage, (lup cheong) and my grandfather's roast pork, (siew yoke). This dish is a-MAZ-ing! I don't know how he does it, but he never fails to turn the skin into crispy, crackly perfection. The meat is perfectly seasoned and so tender that it just melts in your mouth. Steamed fish with ginger, and sweet & sour pork. The pork is first deep fried before being coated in the thick red sauce. So bad, yet so good! As you can imagine, after this meal I was so very full! But Chinese New Year is not for the weak, and I've had many years of training to build up my stamina. So after a few hours of star-fishing on the floor suffering and moaning about my over-indulgence, it was time for dinner! An assortment of roast meat. Here we have roast pork (siew yoke), BBQ pork (char siew) and roast duck. I think this plate was store-bought. Then fish - lightly coated and deep fried, served in a garlicky salty sauce and garnished with spring onions and coriander. Chilli chicken with onions and green beans. My grandmother ate this dish on a recent visit to Malaysia and liked it so much that she decided to replicate it. Am I ever glad she did! My brother is not good on the spices, so it's been toned down so much so that it's hardly chilli at all, but it is such a tasty dish! The chicken is so tender and full of flavour, and the crunchy green beans give it that added texture. Malaysian pork curry. This curry is amazing with a whole lot of gravy drizzled on rice. The rice soaks in all the flavour, and every mouthful is a spicy delight! This dish was kind of like hunting for buried treasure! There was bok choy adorning the edges, and the whole thing was covered in a thick sauce. Those hair-like bits you see is actually seaweed which we sometimes use in braised dishes. There's a layer of cabbage over the whole thing, and underneath that is a braised pork belly with shiitake mushrooms. To complete the meal, we also had achar to serve on the side. Achar is a kind of chilli picked dish served cold, filled with crunchy morsels of cabbage, cauliflower, carrot, green beans, cucumber and carrot with crushed peanuts and sesame seeds in each bite. There was so much leftover to take home that I will be eating this food for days. There are no complaints from me though! Look at all that food... two feasts, surrounded by my families and loved one! If this is anything to go by, I can tell that it's going to be a good year! Did anyone else do anything special to celebrate Chinese New Year? All that food looks INCREDIBLE!!! I loved reading this post - I may or may not be drooling right now :D YUM YUM YUM!!!!! Such interesting story behind it, too! Happy chinese new year! Every new yrs eve, my family always have a massive dinner together and later on we would head out to the temple, watch fire crackers and lion dancing!